Toronto Dogs Directory: The Toronto Pet Daily 2013 Charitable Calendars Are Ready For Order! HO HO HO! 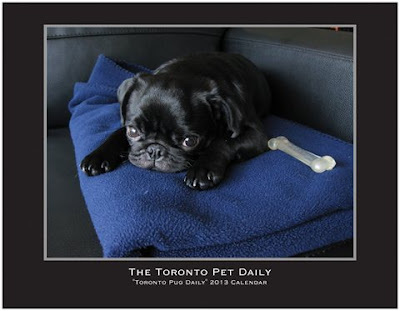 The Toronto Pet Daily 2013 Charitable Calendars Are Ready For Order! HO HO HO! Hi all, I'm very pleased to let you know the TPD "Rescue Me" And "Toronto Pug Daily" Calendars are ready to go, and $5.00 from every calendar will be donated to Helping Homeless Pets, an amazing rescue network! The cost of the calendars is $20 each (the TPD makes no money off the sale, and this takes into consideration the cost to ship the calendars). As well, so we can donate even more money to Helping Homeless Pets, I will be dropping off the calendars to as many within Toronto that I can! It'll be a fun local road trip for me & my poochies & it'll sure save on shipping costs (grrrr Canada Post!). Remember the Seinfeld episode when Jerry took over Newman's postal route and mail was delivered TOO quickly? It'll be just like that. To place your order, click the Paypal link on the advertising page. It's totally secure and you do not need a Paypal account to use the service (there is a link to pay safely via credit card). Multiply the amount of calendars you would like by $20.00 and fill that amount in the space provided. The payment will come through "Lawrence Park Pet Care". THEN fire of an email to torontopetdaily@gmail.com letting me know the number of calendars (and type..."Rescue Me, "Toronto Pug Daily" or both) you paid for as well as your address. Cheers all....now let's start raising some money for an awesome cause! I am also aware that advertising these terrific gifts for the holidays well before Halloween makes me as annoying as Shopper's Drug Mart (please take the advent calendars down already!). Sorry. Update : So far through calendars sold, $240 has been donated to Helping Homeless Pets. Thanks everybody, and remember you have just two more weeks to order!